Act of Kindness #29: Free chocolate, anyone? Happy Random Act of Kindness (RAK) Day! Today, I wanted to do something a little bit more special, while still taking into consideration the limitations of my Chronic Fatigue Syndrome (ME/CFS). And so I decided to hand out a few chocolate bars to strangers in the street! As my budget is also very limited, I thought I’d email a few of the larger confectionary companies to see if they’d be happy to help me by donating a few bars. Unfortunately, I still haven’t heard back from them… but I imagine they must receive lots of requests like mine. I also asked my kind-hearted local Co-op Foods as they’ve given members of our local community – including lucky ole me!- goody bags filled with lovely things around Christmas-time. I was thrilled when they said YES! And I was over-the-moon when they delivered 88 bars of their yummy chocolate (and it really is yummy if you haven’t already discovered it!). And believe me when I tell you I had a LOT Of fun choosing which choccies to buy and couldn’t believe my eyes when I loaded up my trolley with 205 bars – thanks to a brilliant offer on at the supermarket! This makes an incredible, grand total of 300 chocolate bars for my RAK Day giveaway. I wanted to attach one of my kindness cards to each bar, explaining what the give-away was all about. And I’m so thankful for my lovely mum for helping me write them and then attach them to the bars. We couldn’t believe it when we filled up the rucksack-on-wheels my sis lent me for the occasion. And then filled up half a carrier bag too!! This morning, I recruited the much-needed and deeply appreciated help of my lovely mum and 8 yr-old nephew Callum, and we all headed down to our city’s Old Market Square. At first Callum was a little too shy to hand out any bars with us, but it wasn’t long before he joined in the fun and then really got into the spirit of it, which was really heart-warming to see. My mum was absolutely brilliant and was happy to go into some of the city centre shops to hand out bars to the hand-working staff. As we stood in the Old Market Square offering bars of chocolates to passersby, some people practically ran away from us. Some people were a little suspicious at first, but then seemed happy to accept a chocolate bar once we explained what we were doing. And some people happily accepted straight away. We got a few hugs, lots of thank yous, and oodles of big smiles. We were even joined by our city’s newspaper, the Nottingham Post, who’d come along to capture the choc-fest fun! Click here to see what they wrote. With only a few bars left, we were feeling rather hungry and headed for a celebratory lunch. Then after giving all the staff a chocolate bar, we slipped into a city centre car park and popped the rest onto cars so that their owners can enjoy a sweet surprise when they return after a hard day’s shopping. And now as I’m utterly wiped out after all this RAK Week fun, I’m heading to bed for a few days to recover. But I do so with a happy heart and the hope that we’ve made a few people smile this week, and brightened up a few people’s days. ps if you have received one of chocolate bars – thank you for visiting! I’d really LOVE to hear from you in the comments below (and if you’d prefer me not to publish your comment on the blog, please do let me know). ppps please forgive any mistakes as I’m super-duper tired whilst writing this, but I wanted to post before I zonk out! Night, night!! Author HelenPosted on 17th February 2017 17th February 2017 Categories 100 acts of kindnessTags CFS, chocolate, fatigue, kindness, Nottingham Post, Old Market Square, RAK Week, random acts of kindness10 Comments on Act of Kindness #29: Free chocolate, anyone? I am absolutely astounded by how many people my Kindness Advent Calendar is reaching. In just 11 days, over 220,000 people from 172 countries have visited my blog post… and an incredible 68,000 have already downloaded the calendar. I’m absolutely blown away, over-the-moon, stunned, overwhelmed, excited, thankful… you name it, I feel it. But mostly I am deeply heartened at the thought of this huge ripple effect of kindness reaching out all over the world, from Namibia to Nicaragua, Azerbaijan to Antigua, Mauritius to Malaysia, China to Cambodia, Saudi Arabia to Sri Lanka, Bangladesh to Bermuda, and so many more wonderful countries full of kind-hearted folk. I’d like to say a huge THANK YOU to everyone who’s downloaded the calendar and are joining me spreading a little festive kindness. It’s going to be so much fun. I know from my own personal experience how just one small act of kindness can really brighten someone’s day, and also help remind our loved ones, our friends, our colleagues, our neighbours, our children, and people we haven’t yet met, that there is still good in the world. And there really is LOTS of good in the world. A big thank to you the Nottingham Post for publishing this article about my kindness mission. A few days after it appeared on the website, the reporter told me that they usually get between 1-2,000 views per article, but the one featuring my Kindness Advent Calendar had received over 10,000 views. And another big thank you to BBC Radio Nottingham who invited me to have a live chat with the lovely Mark Dennison on their morning show. Did you hear me say ‘LIVE’ – gulp! I’m really excited about starting spreading a little Christmas cheer with you all and would like to invite you to join my Facebook community, Spreading a little kindness, to share our ideas and experiences throughout December. And if you do post about your kindness acts on Facebook or Twitter (come and say hello: @HelenCGreenUK), please use the hashtag #KindnessAdventCalendar so we can all enjoy this wonderful kindness ripple we are creating. ps If you’d like to read the Nottingham Post article, please click here. Today I’ve put the finishing touches to my Acts of Kindness Advent Calendar and I’m thrilled to be able to share it with you. I was inspired by a lovely friend forwarding me a fab one for children a couple of days ago, and I thought it’d be great to create one for us grown ups. And I’d like to invite lovely you and yours to join me in doing a kindness act every day for the 25 days leading up to Christmas. It works just like a normal advent calendar but instead of receiving, we are giving. Now, I know December is an extra busy month for most of us, and we can find ourselves rushing around trying to get everything ready in time for the Christmas holidays. Cheap: well, actually most of them don’t cost a thing, and a couple cost the price of a cup of coffee or chocolate bar in the vending machine. This way, anyone and everyone can take part. You may want to mix it up and swap the acts around, or even make up your own kindness acts. And don’t worry if you can’t do an act of kindness every single day, sometimes it’s just not possible as I know too well with the nature of my CFS flare ups. But even if every one of us manages to do just one kindness act on one day – imagine how amazing that would be! It’s such a wonderful way to spread some festive cheer and boost our own spirits at the same time. But I really need your help. Please help me spread the word by encouraging family, friends and colleagues to take part in this kindness extravaganza as we countdown to Christmas. And I’d be ever so grateful if you could share this blog post with others – simply click on one of the ‘share’ buttons below, or share it however works best for you – and let’s get the kindness ripple effect reaching out far and wide over the festive season. And most of all, remember to have fun and enjoy creating a kindness ripple effect in your community. p.p.s. 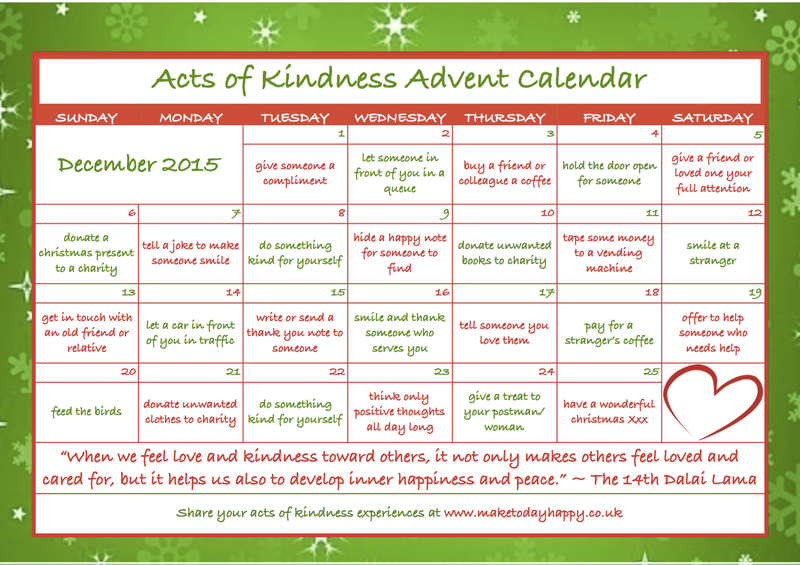 Thanks to EVERYONE who’s shared, forwarded on and/or downloaded my Acts of Kindness Advent Calendar so far – you are AMAZING! 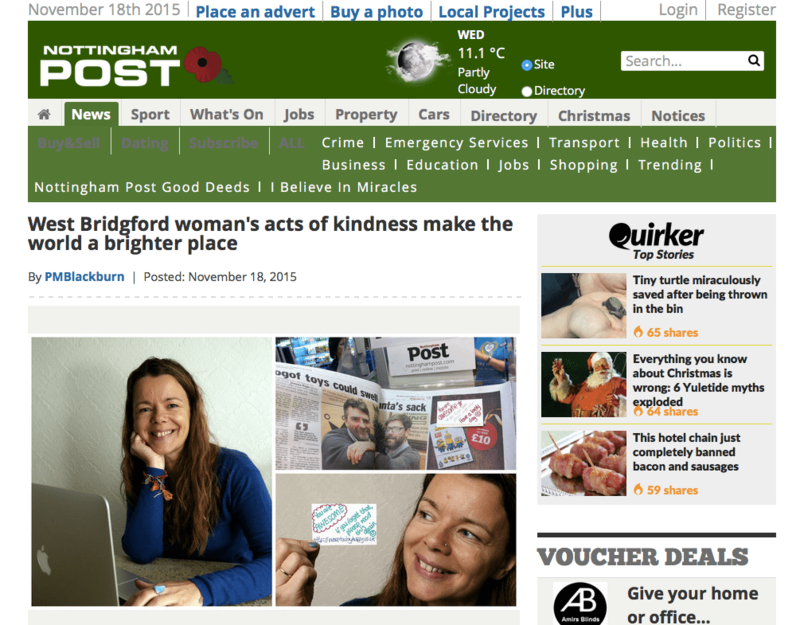 I’m so excited by how so many lovely folk are joining me in spreading the kindness message this festive season, including the Nottingham Post – THANK YOU! What an exciting couple of days! I’m absolutely thrilled to be featured in today’s newspaper, the Nottingham Post, about my acts of kindness. Back in the summer, the Post kicked off a ‘Good Deeds’ campaign encouraging 1,000 readers to do an act of kindness and tell them about it. So, I wrote to them about my kindness acts around the city but I certainly didn’t expect to be featured like this! What a bonus!! I was interviewed and photographed yesterday, and told it would be in today’s paper. As I searched through the newspaper this morning, I got a bit of a shock to see such a big close up photo of me, revealing warts and all. But this isn’t about my vanity, it’s about spreading the kindness message throughout my county! I particularly love and am bowled over by the print version’s byline: “… a one-woman mission to make the world a brighter place.” How fantastic is that! It’s also exciting to see the article in the News section of the online edition. As I’ve mentioned before, when I do my acts of kindness I think it’s really important to keep my intentions pure: I simply want to bring a smile to someone’s face. And I never expect anything in return. My mission is to continue spread kindness and keep the ripple effect going… even more so in light of the recent terror attacks in Paris. It’s easy to lose faith in humanity, but we all must continue to shine our light and continue to spread love and kindness. So with this in mind, my happy for today is being grateful to have my kindness mission featured in the local newspaper.